The last few years have been seminal for IoT. The increasing need for real-time monitoring, the ubiquity of affordable devices, combined with analytics, cloud computing and rising consumer expectations is what is propelling the quick growth of the IoT market in India. Favorable government initiatives such as smart cities, smart transportation, smart grids are predicted to further drive the IoT wave. Proving to be quite a lucrative sector, there are a plethora of vendors to choose from that have penetrated into this segment. Customers are on the lookout for a solution provider that offers accelerated time to market, reduced costs, high quality, lower energy consumption and better customization; a solution that caters to every unique requirement. However, it has been observed that heavily relying on data servers not located within the organization and the utilization of the internet of data communications pose as a huge risk translating to data theft and data loss in addition to hackers honing their skills on information theft. So now, organizations are not only on the lookout for solution providers that can meet all their demands but also need the assurance of mission critical data to be kept safe. Not every vendor in the market is equipped with the ability to meet all the aforementioned needs and thus sifting through the influx of vendors can prove to be an arduous task. 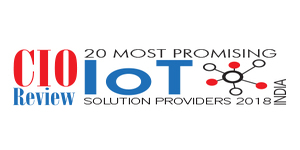 Assisting you to choose the right vendor to work with, CIOReview comes to the aid with a list of “20 Most Promising IoT Solution Providers”. This list features 20 leading-edge vendors in this domain with their deep industry knowledge, years of expertise, team of professionals and proven solutions. The vendors in this listing have been carefully selected by a distinguished panel of CEOs, CIOs, industry analysts and CIOReview editorial team. We present to you CIOReviewindia 20 Most Promising IoT Solution Providers- 2018. ESDS Software Solution Provider of IoT platfortm to help build IoT solutions and services. FuGenX Technologies Provider of IoT hardware development, IoT software development, mobile application development, Custom IoT solution development. Global Edge Software Provider of IoT Gateway solutions for IoT enablement and integration across all verticals. HCL Technologies Provider of IoT solutions for different IoT adoption levels in an organization. Infosys Provider of Industrial IoT solutions and Consumer IoT solutions. Precimetrix Technologies Provider of IoT and analytics solution to manufacturing industry, industrial OEMs,Connected products oriented business and smart city projects. PTC Provider of IIoT solutions for connected enterprise and digital transformation. Vegam Solutions Provider of Industrial IoT solution.